Shimla is a beautiful hill station and also known as “queen of Hills. Manali is situated at an altitude of more than 2000 m from where the eyes fall on the views of forests, orchards, river, mountains ranges and more, for nothing but sheer visual delight. it’s a gateway for skiing in the Solang Valley and trekking in Parvati Valley. Manali is located at northern end of Kullu valley. Manali is one of the best honeymoon destinations of India.When-ever you have holidays in South India, It is time to travel to North & head to Himalayas in Himachal Pradesh, We have specially designed Kerala to Shimla Manali Tour Package for you to enjoy full moments of your holidays in Himachal. The same tour is applicable from Banglore, Chennai, Hyderabad. We proudly offer you to have complete customized tour of Shimla and Manali from Kerala or any where in South India. All major sightseeing of Shimla Like Mall Road, Ridge, Hadimba Devi temple, Church etc. All local sightseeing of Dharmshala like Mcleodganj, Bhagsunag waterfall, Tibetan Monastery, Cricket Stadium. We have created This package specially for South Indian Guests and kept it as inexpensive as possible, yet quite magnificent and practical. This package of 5 nights 6 days offers Pick up and Drop at Chandigarh Airport or Railway Station. We are offering your stay in 5 nights Say Shimla Manali's Best and most recognized resorts and Hotels. 2 Nights in Shimla Hotel, 3 nights in Manali Hotel. In this package, we have taken care of minutest details and you will appreciate these aspects, ranging from your meals to the rooms and views offering attractive scenery. Extensive Site Seeing and touring of both Manali and Shimla is covered in the package. Air faire / train faires etc. Entrance Fees for visiting Monument, Monasteries & Museums and Camera Fees. Arrive at Chandigarh Airport/Railway and our representative will pick you from there and proceed to Shiml By a Seprate Ac Cab. It is arround 115 km and take 3-4 hours to arrive. After arrive check into hotel for freshup and take some rest. After that visit local sightseeing of shimla like Jakhu Temple, Kalibari Temple, Church, Mall Road, The Ridge. In between your visit have lunch And some rest at Hotel Alfa Resturant. After that check into hotel and overnight stay at hotel. Kalibari Temple: The another famous place of worship is Kalibari Temple of Shimla. This is a popular tourist attraction and is situated at a very strategic location. The temple was built in the year 1845 and is dedicated to Goddess Kali who is also known as Shyamala. Shimla derived its name Fom Goddess Shyamala. After breakfast proceed for visit Kufri. Kufri is a small hill station in Shimla district of Himachal Pradesh state in India. 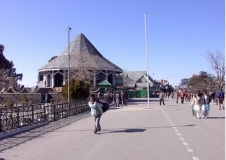 It is located 13 km from the state capital Shimla. The name Kufri is derived from the word kufr meaning "lake" in the local language. Kufri has a Himalayan wild life zoo which hosts rare antelopes, felines and birds including the Himalayan monal, the state bird of Himachal Pradesh. After that came back to hotel and overnight stay at hotel. The Himalayan Nature Park : Sprawled across 90 hectares and comprising of a diverse range of western Himalayan flora and fauna, the Himalayan Nature Park (also referred to as the Kufri National Park) is home to a large variety of animals. Mahasu Peak: This is the highest point in Kufri, so great views are a given-on a clear day you can even see the Badrinath and Kedarnath ranges, but the best way to do it is by undertaking the challenging hike through a thick forest. After breakfast check out from hotel and proceed to Manali. It is arround 250 km and takes 7-8 hours to complete journey. The Journey is too long so we will break journey at Mandi have lunch and some rest at Hotel River Bank. Aftert arrival check into hotel and overnight stay at hotel. After breakfast visit some local sightseeing of Manali like Hadimba Devi temple, Rahalla Falls, Monastries , Gompa, Vashisht Temple, Manu temple. In Between your visit have lunch at casa Bella Vista and some rest there. After that came back to hotel and overnight stay at hotel. Lunch: In Between your journey have lunch at Adarsh Resturant ( The Mall Oppo. Himachal Tourism Office, Manali, Himachal Pradesh 175131) Enjoy to have South Indian Food. After breakfast check out from hotel and proceed to Chandigarh. It is arround 310 km and take 7-8 hours to arrive Chandigarh. Our representative will drop you at Chandigarh Airport/Railway Station. After that Get Evening Train/Flight For South India (Kerala, Tamilnadu, Andhra, Karnataka). Mall Road Shimla: The Mall Road is the main street in Shimla, the capital city of Himachal Pradesh, India. All colonial structures are located on the Mall Road. The Mall Road is also famous for its wooden furniture shops that sell exquisite wooden articles, which look like antiques. Tibetean Monestry: The another famous location is Tibetean monestry. Manali has various colorful monetries. These monasteries serve not only as a place of worship but also as guardians of the rich culture and history of the Tibetan people settled in Kullu and Manali. Manu Temple: A famous and significant pilgrimage spot, the Manu Temple is the only temple in India for Lord Manu, the legendary sage who stayed in this area. Manali got its name from lord Manu. Its close connection with the seventh incarnation of the sage is due to mythology that states his saving the Vedas and the seven sages from inundation during the great flood. Vashisht Temple: Vashist, a small village 3 kms from Manali located on the Left Bank of River Beas in Manali towards Rohtang pass is worth a visit, which is renowned for its Hot Water Springs and Temple. The village is also the site of some old temples, dedicated to the great sage Vashisht, and to Lord Rama. The Himachal Tourism sulphur baths are just beyond these shrines. Natural Hot Sulphur Water Springs with two separate bathing tanks for Gents and Ladies, which are always full of tourists. Turkish Style Showers fitted baths have also been built nearby. Hot water from the nearby Spring is provided for bathing. Rahalla Falls: It is 51 km from Manali. Located at a height of 3980 m, the Pass once served as a crucial trade route, and still remains the gateway to the districts of Lahaul and Spiti.The Pass is open from June to November each year, and provides wonderful views of the entire surroundings. Just beyond the Pass is the Sonapani Glacier and the twin peak of Gaypan. The Beas Kund, the source of the Beas river, a holy site for Hindus, as the sage Vyas is said to have meditated at this spot, is also accessible from the Rohtang Pass. By Bus: Chennai to Shimla is long distance journey so you cannot reach Chennai to shimla direct, so you can go Chennai to Delhi by Flight or train, then you can travel shimla by bus which is 342 km away. By Train: There are 3 – 4 Trains are available to reach shimla. Kalka is a small railway station that connects trains to Shimla. This travel from Kalka by Shimla train travel is in a toy train that travels through 103 tunnels. By Bus: Hyderabad to Shimla is long distance journey so you cannot reach Chennai to shimla direct, so you can go Hyderabad to Delhi by Flight or train, then you can travel shimla by bus which is 342 km away. By Flight: Shimla does not have its own airport. Jubbarhatti, 23 km away from the town, is the nearest airport to Shimla. There are regular flights to Shimla from Chandigarh and Delhi.it takes 2 hours to reach by flight. By Bus: Chennaito Shimla is long distance journey so you cannot reach Chennai to shimla direct, so you can go Chennaito Delhi by Flight or train, then you can travel shimla by bus which is 342 km away. By Bus: Hyderbad to Shimla is long distance journey so you cannot reach Chennai to shimla direct, so you can go Hyderabad to Delhi by Flight or train, then you can travel Manali by bus which is 342 km away. By Train: There are 3 – 4 Trains are available to reach shimla. Kalka is a small railway station that connects trains to Manali This travel from Kalka by Manali train travel is in a toy train that travels through 103 tunnels. By Flight: Manali does not have its own airport. Jubbarhatti, 23 km away from the town, is the nearest airport to Manali. There are regular flights to Manali from Delhi. It takes 7 hours to reach by flight.